From beer to mixed drinks, we have what you want! Leo’s Outpost located at 600 S. Pennsylvania Ave., between Kalamazoo and I-496. 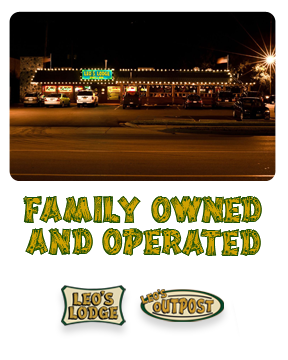 Leo’s Outpost opened the doors for business in November of 2002. As part of the downtown area, Leo’s Outpost offers more convenience for its guest, such as free parking, plenty of seating and an escape from the lines associated with most of downtown bars and restaurants. The Outpost also features the same unique recipes that has made the Lodge so popular. Order a $4.00 Jack Daniels on Wednesday, or kick back on Thursday with a $5.00 Long Island Ice Tea. But wait, you can’t forget $4.00 Captain Morgan every Friday. So if you’re into good food, friends, and an up north atmosphere, we’ll see you here!